Scott Essential provides reliable balance of efficiency, performance and value. Scott Essential 1-ply Jumbo Toilet Paper Roll is a reliable and practical choice for your restroom. After all, you have better things to think about than changing your business’ toilet paper rolls! One roll of this high-capacity tissue is 4,000 feet long and equals nearly 20 standard rolls. 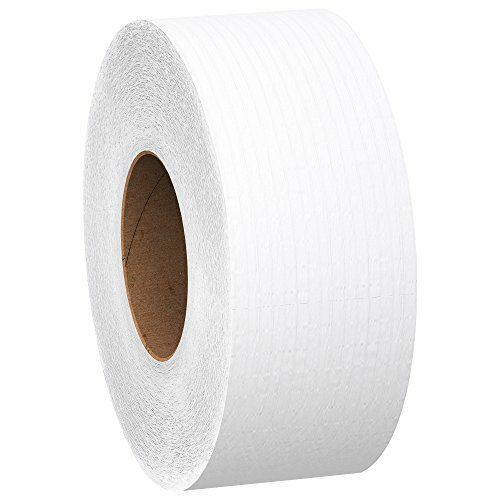 This large toilet paper roll is designed to fit in high-capacity dispensers, so the system is ideal for high-traffic areas, reducing run-outs and refills. In addition, it meets EPA standards for minimum post-consumer waste content and is FSC and EcoLogo certified. Scott Essential Jumbo Roll Bathroom Tissue offers great value and is the ideal balance of strength, absorbency and economy. With Scott Essential Brand products, you get the quality and performance you can count on – and still stay within your budget.